My name is Tanya Wright. I am an actress who currently appears in the role of Deputy Kenya Jones on HBO's TRUE BLOOD. 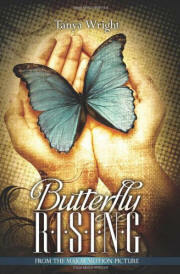 I recently completed work on my directorial debut—BUTTERFLY RISING-- and written a book by the same name. I was familiar with the book/movie THE HELP from a variety of sources. It shot in Greenwood, Mississippi. I stayed nearby as I completed work on BUTTERFLY RISING while on hiatus from playing the sassiest cop in Bon Temps, LA. THE HELP, I had heard, was a story written by a white woman about domestics. I went on my way. A year or so later, I heard that THE HELP would soon be flying into theaters and folks—mostly African-Americans-- were up in arms. The debate on FACEBOOK was particularly fierce. A friend forwarded me a very strongly worded letter by a prominent African-American female group denouncing the movie in every way possible. In the meantime, I had just completed editing my movie and was about to embark on devising a plan to market and release it. But it was hard, as there are a lot of unconventional components to my movie: mostly, this "black woman/white woman" dynamic wasn't one often explored in film and there was that tricky "period" feel—not to mention that some of the story was downright provocative. The film was less about race, but more about friendship, love and loss. I shot the movie before I wrote the book (usually it's the other way around), but I halted the movie editing process and followed my urge to write a piece that would chronicle the forty-year friendship of a black woman and a white woman until the day they died. "What? A book? NOW??" I thought. I always knew I had a book (or two) in me, but I thought I'd write one much later in life, when I retired to Tuscany to eat vine-ripened tomatoes, olives and spend my days gardening in straw hats. I was so intrigued by the letter my friend sent me, we agreed to go and see THE HELP. Immediately, I noticed there were similarities between BUTTERFLY RISING and THE HELP: the white woman/black woman stuff; the period feel; the southern/female empowerment story and the book component. But the differences were stark, too: in BUTTERFLY RISING, the black and white woman are EQUALS in every way. The other stark difference was that BUTTERFLY RISING had a spiritual component that remained largely absent in THE HELP. BUTTERFLY RISING is a story about two women who take a road trip to meet a mythical medicine man named Lazarus of the Butterflies. Loosely based on the story of Mary and Martha from the Bible, Rose Johnson (our "Mary") is black and Lilah Belle ("Martha," the 'grief stricken singer who doesn't sing anymore'), is white. In BUTTERFLY RISING, Rose Johnson and Lilah Belle are not literal sisters, but metaphorical ones. When we see Mary and Martha in the Bible, they are mourning the death of their brother, Lazarus. It was a story that resonated with me—I crafted Rose and Lilah in the image of these two Biblical woman and wrote until I could write no more. I was in the throes of a deep and profound transformation of my own: my brother had just been murdered. After his death, my world caved--then changed, radically. I didn't feel like I was living my full potential, so I clung to my writing like a boat out at sea. Creating BUTTERFLY RISING eased what it could of my profound grief. I'm not here to debate THE HELP. I rarely get riled up or emotional over racial matters-- my response is to take action by a committing to being the very best that I can be and, simultaneously, investing in someone who looks like me. Whether you enjoyed THE HELP or not, I do hope you'll support BUTTERFLY RISING. It is a book worthy of both your time and attention. Please support BUTTERFLY RISING by purchasing a copy of the book (directly from our website if possible: see below)! While it is selling strong, my goal is to reach the numbers Sockett produced for THE HELP. Lofty? Perhaps, but I've never been one to back away from a dream. My book is self-published and the film is independently produced and currently has no distribution. BUTTERFLY RISING is a rich and infinitely hopeful story. It is my hope that the book and movie will both help and inspire people to live their dreams, just as I am living mine. Many thanks to those who have already purchased the book, and especially to those who work on behalf of BUTTERFLY RISING both visible and invisible. HERE'S WHAT YOU CAN DO NOW TO SUPPORT BUTTERFLY RISING! BUY THE BOOK from the website! While the book is available in all the places books are widely sold (bookstores, amazon.com, barnesandnoble.com, etc. ), the royalty rate is better for us if you buy it DIRECTLY FROM OUR WEBSITE. Plus, Tanya will personally sign each and every book purchased from the site. An e-book version is also available on Kindle. Join the BUTTERFLY RISING FB fan page! where you'll find all kinds of fun stuff, including a weekly "talk show" called TANYA TALK: THE FACEBOOK TALK SHOW ON ALL THINGS BUTTERFLY RISING! A single-camera "confessional" style show, Tanya will give you the latest updates on the book/movie, enlist your help in decisions to be made (there's also a game in the works!) and hold weekly contests. SHARE this article and SPREAD THE WORD about BUTTERFLY RISING. Thanks!